I noticed recently that most of the time that I see people walking alone, they are doing so with their heads hanging down low- as if they are weighed down by the burdens they are carrying on their shoulders. In a school, on the sidewalk, at the grocery store- head down. They don’t make eye-contact and seem to be cautious and guarded. It is as if they don’t want to be seen. Fixing their eyes on the floor appears to be their way of avoiding being noticed. After noticing this I have caught myself several times lately doing the exact same thing- usually when I am deep in thought or worried or discouraged. You may be in that place today-head down, feeling like your situation is hopeless, that everything is going wrong and you simply can’t get your head above water. You may feel alone and discouraged. If that is you today, I have some good news! It is important to know that David wrote this beautiful Psalm during the absolute worst time in his life. His son, Absalom, wanted his father’s crown and had launched a plot to assassinate him. Those closest to him (not strangers- his closest friends), those who he trusted and placed his confidence in, were now those who against him and were actually trying to kill him. Poor David was betrayed, crushed and heartbroken and forced to flee his palace and Jerusalem in fear for his life. Psalm 3 was his written plea to God. In this verse he reminds himself (and us) of three things he knows to be true about God. One, God is a shield. Now a shield doesn’t mean that you won’t have arrows shot at you- just that you’ll have protection from those arrows. Two, God is his glory since he has no glory of his own. Third, God is the one who lifts his head. He is defeated and depressed and his head is hung in shame. He is confident though that God will lift his head and restore his hope. When we are looking down, our eyes are only fixed on a small area of the ground below us. What we see is a very limited space. But when God lifts our head and we look up- we see the whole horizon before us and all that God has created and has in store for us. My sweet friend Gina is from Kentucky and I remember the first time she visited us in Texas. She kept mentioning the “big sky”. Finally I asked her what she meant, because the sky was the same in Texas that it was in Kentucky. She explained that because of the mountains in KY, the view of the sky was limited. But since Texas is so flat, the horizon is huge. In other words, BIG SKY. I like to think of God lifting my head and me noticing that big, huge sky- and all the other things He has created. Is your head down today? Look up sweet friend. God is with you in the dark places. He sees you there. He is a shield around you. He is the glory. 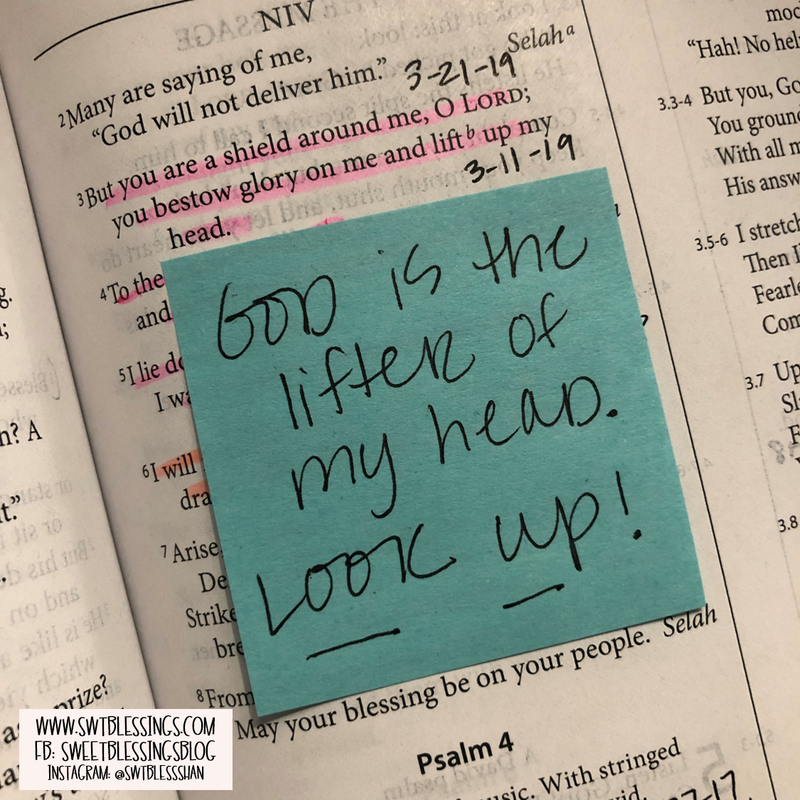 He is the lifter of your head. He loves you so. My prayer for you today is that you would call on His mighty name and ask him for help now- allow Him to lift your head.